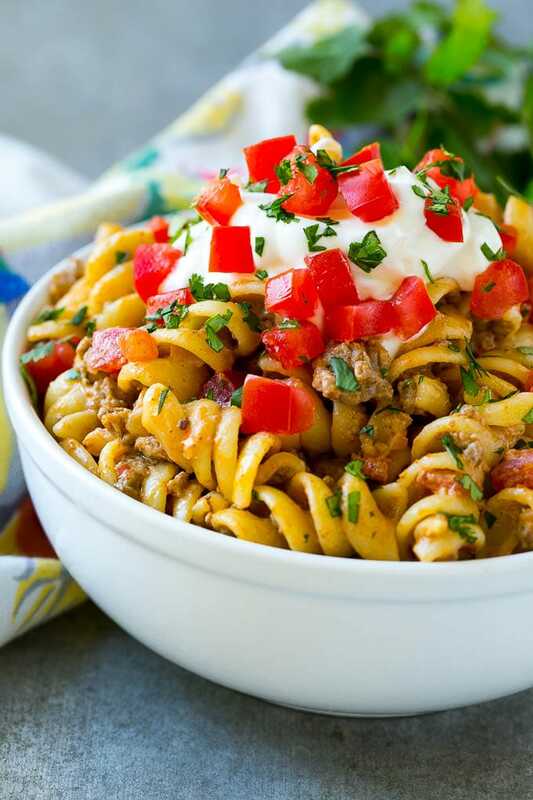 This easy taco pasta is made with ground beef, tomatoes, and plenty of cheese, all tossed in a creamy sauce. Garnish with your favorite taco toppings for a quick and family friendly dinner option! Tacos are always a hit with both kids and adults. 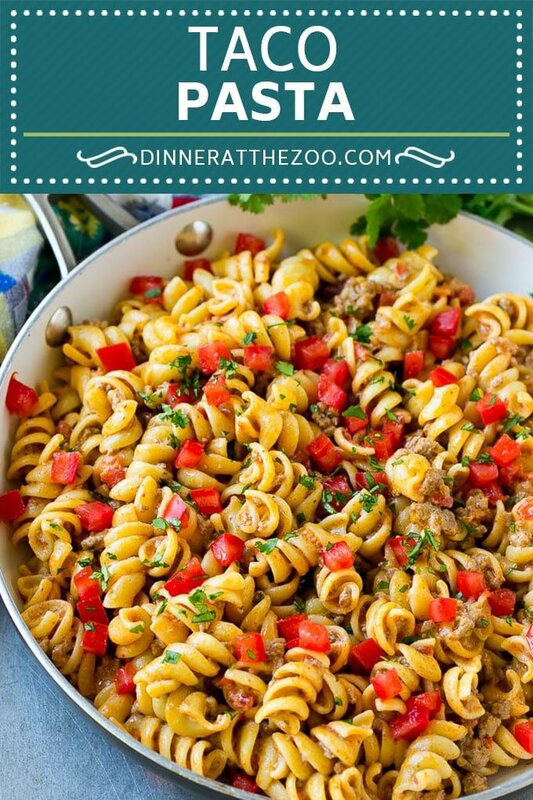 This taco pasta is a unique way to get your taco fix with minimal work. 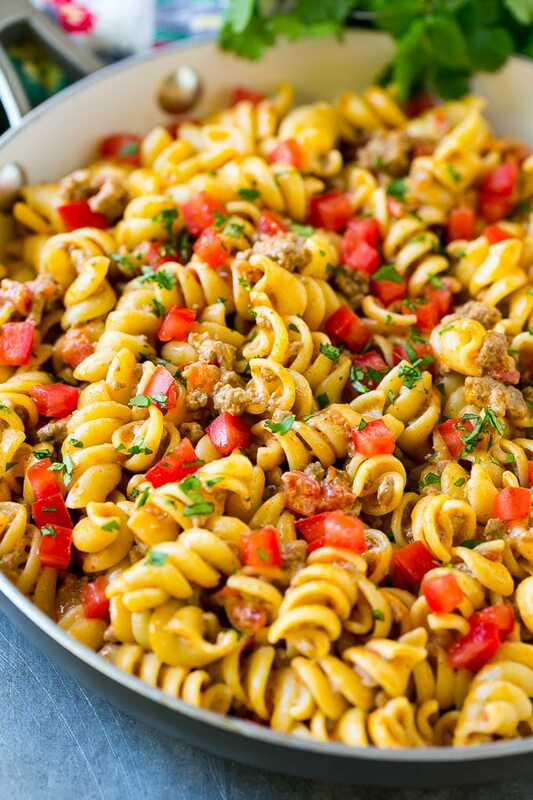 Creamy, cheesy taco pasta is one of my girls’ most requested recipes. I’m always happy to oblige because it’s a hearty meal and only takes about 20 minutes to whip up, perfect for a busy night! The best part of this recipe is you can add as many toppings as you like to really get that loaded taco experience, but in pasta form. 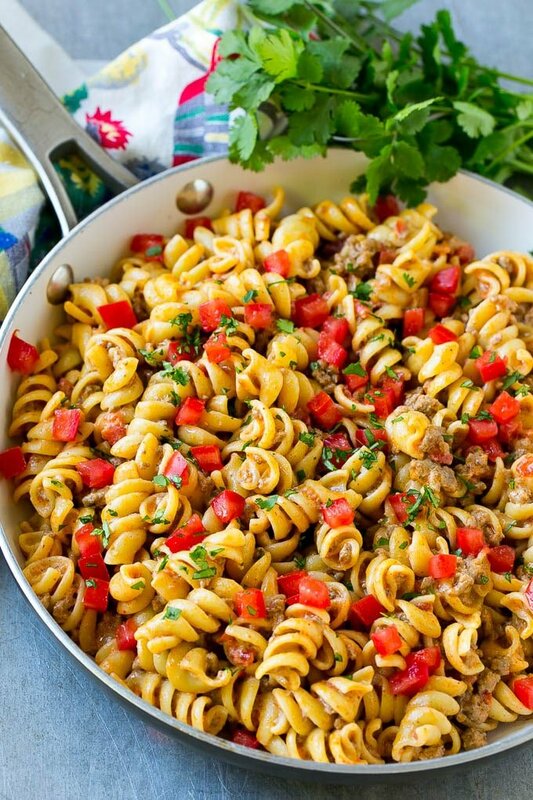 To make taco pasta, you’ll need ground beef, onions, pasta, tomatoes, cream cheese and sour cream. 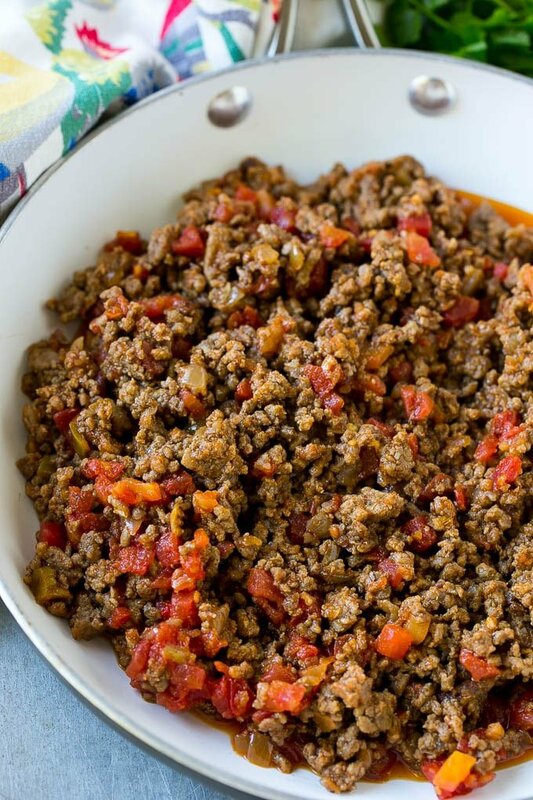 The first steps is to cook the ground beef with onions, tomatoes and taco seasoning to form the base of this recipe. 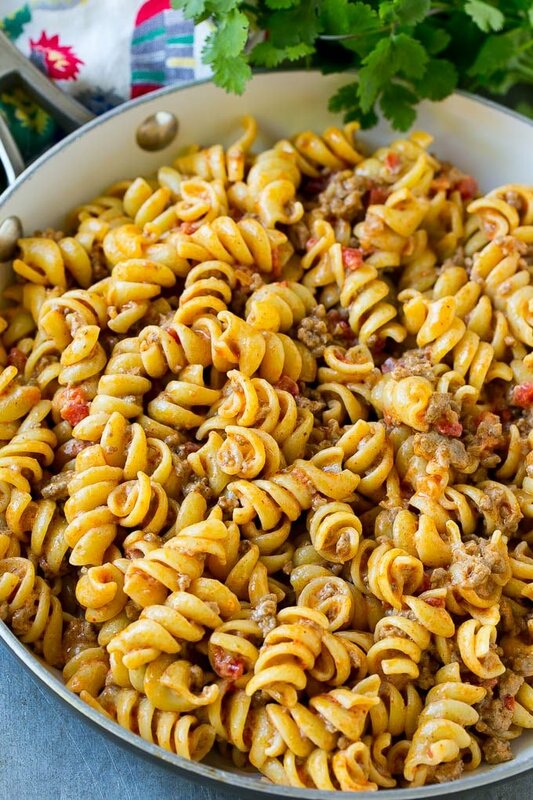 After your meat mixture is done, cooked pasta goes into the pan. 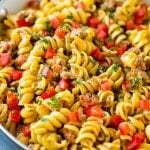 I used rotini but any short pasta will work, such as penne, shells or macaroni. I cook my pasta at the same time as I make my meat to save on time. The next step is to make the sauce, which is a combination of cream cheese, sour cream and shredded cheddar cheese. Be sure to save some water from cooking the pasta in case you need to thin the sauce. 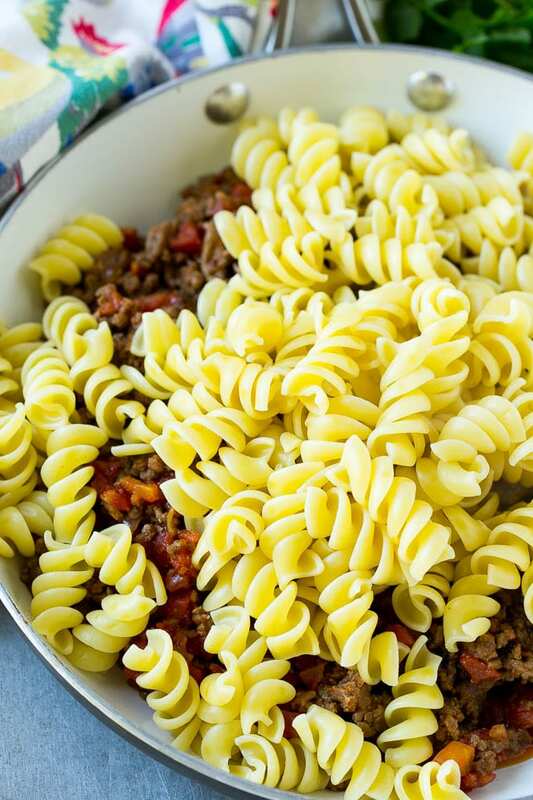 What kind of ground beef is best for pasta? I typically use 90% lean ground beef. It’s flavorful, yet not overly greasy. If you use ground beef with a higher fat content, be sure to drain off any excess grease before you add the pasta to the pan. Looking to save a few calories? Ground turkey or ground chicken can also be used in this dish. While the pasta is cooking, prepare the beef. Heat the oil in a large pan over medium high heat. Add the ground beef and break up with a spatula. Cook for 4-5 minutes or until meat is browned and cooked through, and onion is tender. Add the tomatoes and taco seasoning to the pan and stir to combine. Pour the cooked pasta into the pan with the meat. Reduce the heat to low. Add the cream cheese, sour cream and cheddar cheese to the pan. Cook, stirring constantly until cheese are melted. Add reserved pasta water, 1 tablespoon at a time, if needed to thin the sauce to desired consistency. Sprinkle with tomatoes and cilantro and serve. Add additional taco toppings if desired. Love this yummy pasta and my family will also! Tacos and pasta – my two loves! 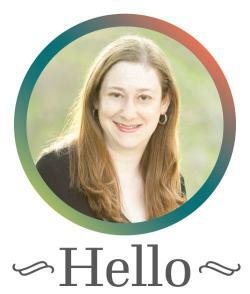 This looks AMAZING and sounds easy enough to make so a rookie (hi!) won’t burn the house down! I think this has made its way onto my ‘to cook’ list! This looks so amazing and yummy. It is super easy too, so I can make it after work when I am tired. Wow, I’m not a taco girl but reading through this got my mouth watering! This looks so fun to make. Definitely perfect for get togethers and night-ins. Wow this taco pasta is just what I was looking for. It looks delicious!!! This looks so tasty and colorful. I can’t wait to give this recipe a try. This recipe looks really good. I will try a vegan version of it and see how it comes out. I love all kinds of pastas and i love tacos, this is a perfect combo! think taco pasta looks incredible. love love love. i like how easy it is to make and how it comes together in no time. and full of flavor.